An artist's rendering of life at Fort Ligonier. It accurately depicts garrison life and activities around the fort as well as its structure, shape and size. Most of the people and activities at a fort were outside the walls. There simply wasn't enough room inside for everyone and everything. Much of the needed support activity was done from wagons, tents, canopies and lean-to's. Even most of the troops might be outside the walls in tent cities. If threatened, the fort would fill quickly. Families, livestock, weapons, food, horses, wagons and more would be crammed into the compound. These crowded circumstances quickly became unhealthy and couldn't be sustained for very long. Tucked away in the western foothills of Pennsylvania's Allegheny Mountains stands a beautifully restored French and Indian War fort that is right out of a Hollywood movie set- Fort Ligonier. Located in Ligonier, Pennsylvania in a region called the Laurel Highlands, Fort Ligonier saw it all in its short eight year life. It survived war and Indian uprisings, withstood direct attacks and saw the great western migration arrive and move on, taking the colonial frontier with it. Fort Ligonier was built by the British in the summer and fall of 1758 as part of the Forbes Expedition to capture Fort Duquesne during the French and Indian War. This French fort at "The Forks" - the junction of the three rivers in present day Pittsburgh - was a main base of operations for French soldiers and Indian raiders. It had bedeviled the British for years, who tried and failed to capture the fort twice before. The first attempt, led by George Washington in the spring and summer of 1754, ended very badly. 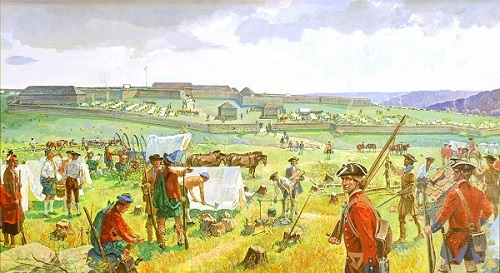 French troops from Fort Duquesne surrounded Washington's force holed up in a small make-shift defensive compound called Fort Necessity. After a hopelessly one-sided two day fight in the pouring rain, Washington was compelled to surrender or face annihilation. The Battle of Fort Necessity on July 3-4, 1754 was the only surrender of his career and he never forgot it. A year later, on July 9, 1755, Washington was back and on the march with General Edward Braddock, who was leading the second British campaign to capture Fort Duquesne. On the banks of the Monongahela River only six miles from their objective, Braddock's army collided with a force of French and Indians half its size. While the British lined up in ranks and volley fired, their enemy whipped around both flanks and cut them to pieces. When it was over, 500 British soldiers were dead - including General Braddock. The disaster at the Battle of the Monongahela, more commonly known as Braddock's Defeat, ended British military presence on the colonial frontier comprising present-day western Pennsylvania and western Maryland along with parts of Virginia and West Virginia. The French and their Indian allies ran amok in the British colonies for three years. A Google Earth view of Fort Ligonier. Its key features are clearly visible, including multiple walls, obstacles, the main artillery battery and the bastions on the four corners of the inner compound. The eastern redoubt was the target of a night attack on October 12-13, 1758. It was repulsed. Lt. Col. Bouquet incorporated just about every feature found in then state-of-the-art European fort building. The area shown is about eight acres. There were more walls and redoubts further out in the original fort but they were left out of the reconstruction because of space constraints. Diagonally across the compound from wall to wall is about 500 feet. It was a big fort, well designed and well defended. Loyalhanna Creek originally flowed at the base of the cliffs below the sally port. It was moved 200 feet north when Route 30 was built. Also, all vegetation in the immediate vicinity would have been cleared away, at least out to rifle range. This denies cover to the enemy and keeps fields of fire clear for the defenders. Forbes was well aware that the French defenders of Fort Duquesne liked to sally forth from their position and attack the attackers while they were still miles away. They had done it very effectively twice before against Washington and Braddock. As his force consolidated on the banks of the Loyalhanna Creek, Forbes worried that the French could show up at any time and end the fight before it started. He was determined to be ready for anything. The defensive preparations in and around the fort were formidable. This is the entrenchment around the main artillery battery on the high ground. You can see another defensive belt of abatis further out. If the outer walls of the fort had ever been penetrated, the defenders would have made their last stand behind this belt. Breaching obstacles like these requires either explosives and artillery to blow them apart or a massive number of men to simply overwhelm them. If I had to attack this with just infantry, I'd throw lots of ladders across it and all my assault troops would have axes, picks, crowbars and tomahawks. With a base of fire to keep the defenders' heads down, we'd be across quickly but it would be very costly. The French never had the combat power to take Fort Ligonier, but the British didn't know that. Most of a fort's activity is in the surrounding area. Only in times of danger does everybody gather inside the walls. So it was with Fort Ligonier. With the imposing structure of the fort dominating the skyline, the Post at Loyalhanna became a bustling wilderness city of 5,000 people with activities spreading for several miles outside the protective walls. By August 1758, after four months on the march, all the support needed for Forbes 6,000 man army and the upcoming siege was getting ramped up. Blacksmiths, wheelwrights, bakeries, kitchens, a hospital, repair shops, gunsmiths, mercantiles and more all set up shop outside the gates. Construction was non-stop. Work continued on the Forbes Road while supply trains, reinforcements and couriers flowed along it. Hunting, fishing and gathering parties ranged for miles. Livestock grazed everywhere. All of this was under constant surveillance by the Native American allies of the French. In early September, the defenders of Fort Duquesne decided it was time to pay a visit to Fort Ligonier. The French commander unleashed his Indian raiders. Though not yet finished, Fort Ligonier received its baptism by fire in the first week of September, 1758. The hustle and bustle in and around the fort came to a screeching halt with the return of the dreaded Indian raids that had terrorized the region ever since Braddock's Defeat over three years earlier. The number of raiders probably never exceeded a couple of dozen, but their reputation preceded them. Swift, unpredictable and savage beyond belief, there was no faster way to shut down a community than to breath the words "Indian raid". Fort Ligonier was no exception. The raiders hit the soft targets outside the fort. Hunters, fishermen, shepherds and gatherers never knew what hit them. Livestock was killed or stolen. Outlying structures were burned and tell-tale columns of smoke dotted the near horizon. Long distance rifle fire was directed at the fort. The Loyalhanna became a very dangerous place. At night, they moved closer, looking for a way in. The fort's artillery saw its first action, shooting harassing fires of its own. Under a moonless sky, the black nights were filled with gunshots, cannon blasts, screams and the dreaded "scalp halloos" of the Indians. The Forbes Expedition ground to a standstill. It was like this for a week. Then as suddenly as they had appeared, the raiders were gone. Human casualties were minimal, but the overall effects of the raids were disastrous for the British. The Battle of Grant's Hill was very one-sided, as the British showed yet again that they were not proficient in fast moving, close in wilderness fighting. Grant lost almost 400 of his 800 men and was himself taken prisoner. The area where the battle was fought is now in the middle of the "Golden Triangle" in downtown Pittsburgh. The site of the heaviest fighting is now the location of the Allegheny County Courthouse built in 1884. Grant's Hill itself was bulldozed flat in 1912 to accommodate the explosive growth of Pittsburgh. The area is still called Grant's Hill. As fate would have it, Lt. Col. Bouquet was not at Fort Ligonier during the raids. He arrived a few days after to find a terrified community, a squalid fort and a campaign completely off the rails. The entire force was cowering because of a couple of dozen Indians roaming the countryside. This was the army that was about to lay siege to Fort Duquesne? They had to re-take the offensive and re-establish their freedom of movement. They also needed hard information on the objective. Bouquet decided to send a raiding force of his own to Fort Duquesne. The leader of the raid was Major James Grant, a testy Scotsman who was tired of building roads. His orders were to create as much mayhem as possible around the fort, capture prisoners and bring back intelligence. He was NOT to risk his force by getting into a general engagement. He moved out of Fort Ligonier with 800 men on September 9, 1758. Four days later, he was on a hill in what is now downtown Pittsburgh looking down at Fort Duquesne. He had gotten there undetected and was on his way to a successful mission. Then he got stupid. Grant's debacle spooked everybody and cast a pall over the entire campaign. Once again, the British had been out-fought in an ill-advised woodland battle. To make matters worse, wild-eyed survivors claimed Fort Duquesne was an impregnable fortress defended by thousands of French soldiers and Indians. Nevertheless, Forbes was confident and resolute. He was determined to seize Fort Duquesne before winter set in. Preparations continued and work on the fort accelerated. Forbes wanted it ready to go before they stepped off for Fort Duquesne-just in case. A month later, preparations were nearing completion. The Indian raids had been over for weeks and a sense of security and normalcy was beginning to return. Tent cities outside the walls housed entire battalions of soldiers. The fort was at its strongest stage yet and now had 18 artillery pieces dug in on the high ground and in redoubts along the walls. The Forbes Expedition was getting ready to finish the job that started almost five years ago. 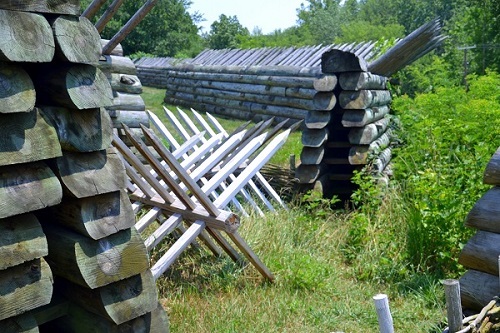 The French attack on Fort Ligonier wrecked all the outer camps and sent over 2,000 British soldiers scrambling to the shelter of the stockade. For 24 hours, Captain Aubry's men probed, sniped and looted. When they left, they took everything they could eat, ride or carry and destroyed the rest. The commander of the French garrison, Captain de Lignery, knew all this because his scouts had Fort Ligonier under constant surveillance. His own fort was on its last legs, literally rotting and falling apart. He had been ordered to destroy everything and abandon Fort Duquesne when the British started closing in - whenever that might be. Despite that, de Lignery still believed he could stall the British until spring. They had been sitting at Fort Ligonier for weeks. They had not fought well in recent engagements nor had they detected any French scouts. Maybe a winter in the cold, snowy Pennsylvania mountains would take the fight out of them. He decided to attack Fort Ligonier with his entire remaining force of 450 soldiers and 150 Indians. It would be led by Captain Charles Aubry, a very tough and experienced wilderness fighter who led the counterattacks on Grant's Hill. The impending fight, the Battle of the Loyalhanna, would be a major battle and the toughest test for Fort Ligonier. On Thursday, October 12, 1758, General Forbes and Lt. Col. Bouquet were both away. Colonel James Burd of the Pennsylvania militia was in temporary command at Fort Ligonier. Around noon, there was sporadic firing at one of the outer grazing areas. Burd sent a small patrol to investigate and they soon came running back after encountering a much larger French force. Burd mustered a 500 man reaction force and sent them to deal with it. They too came running back. About this time, the wood line all around the fort erupted in gunfire. Small groups of attackers swooped into the tent cities burning, slashing and scalping their way through them. Entire battalions were upended. Captain Aubry had caught the British flat-footed and they were all running for the safety of the fort's walls. British artillery opened fire, keeping the French at bay. However, they spent the next 24 hours harassing the fort. They burned, wrecked and looted everything they could, often within full view of the garrison. On the night of the 12th, they attempted a night attack on the eastern redoubt, which was repulsed. Just like the Indian raids six weeks earlier, the rest of the long terrifying night was filled with artillery fire, gun shots and the dreaded "scalp halloos" of the Indians who were lurking all around them. 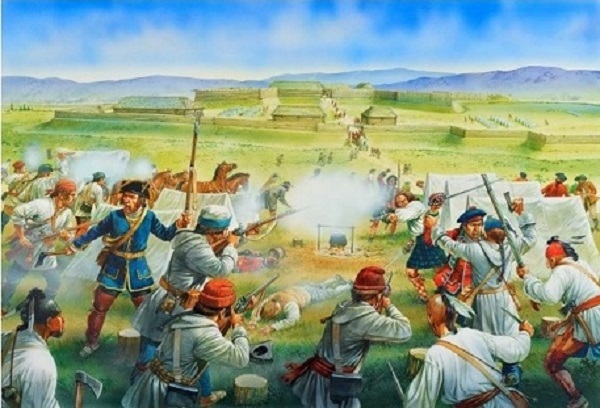 The attackers also ambushed a hapless supply column arriving at the fort, taking cattle and other badly needed supplies. Throughout all this, Forbes' army sat inside the walls of Fort Ligonier and essentially did nothing. Artillery carried the day (and the night). When the French quit the attack the next morning, they took with them every horse, cow, chicken and goat at Fort Ligonier along with weapons, loot and an unknown number of captives. What they couldn't carry they destroyed. Then they headed back to their own rotting decrepit fort. The French reported light casualties in their reports - 2 dead and seven wounded. All were taken back to Fort Duquesne. They also reported taking over 100 scalps. The British reported light casualties - less than 100 total - but that number seems low. Regardless, it was another damaging blow to the campaign. The French had made fools of the British army once again. "...this enterprise, which should have cost the enemy dearly, shows a great deal of contempt for us, and the behavior of our troops in the woods justifies their idea only too well." Most enclosed forts have at least one "sally port". This is an opening in the wall that allows access to the fort from a place other than the regular gates. They are used to launch counterattacks, bring in reinforcements or to escape if things get terminal. Since they are openings, they can also work for the enemy. Sally ports have to be heavily guarded and fortified yet flexible enough to be used at a moment's notice. Ideally, they should be well camouflaged. Here is a sally port on the south wall of Fort Ligonier. The defenders are on the left. To the right, you can see the corner of a wall in front of it to prevent a headlong rush and it's filled with obstacles that can be moved out of the way. The obstacles in this photo are called "Frisian horses". 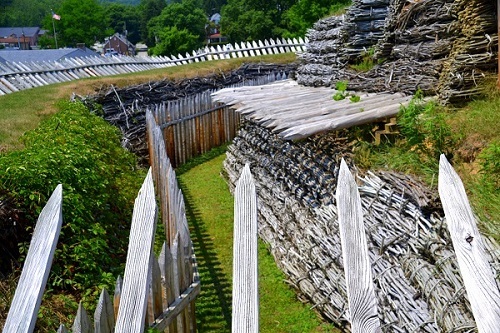 They have been used for centuries in defensive combat and Fort Ligonier had layers of them. You can't see it, but just to the left of the obstacles is a cannon pointed right at the portal at point blank range. Also note the construction of the walls. Double horizontal logs with reinforcing braces in between and often filled with dirt. Fort construction doesn't get any tougher than that. The greenery on the right is on top of cliffs that lead down to the Loyalhanna Creek. Despite the lackluster performance of the British army, the Battle of the Loyalhanna was a French defeat. The fort was still in British hands with the necessary forces to attack Fort Duquesne and the French knew it. They returned to The Forks and made ready to destroy and evacuate as ordered. Their remaining Indian allies went home. 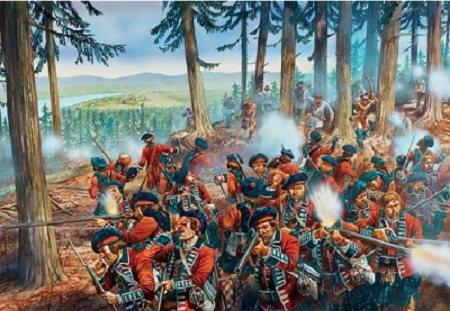 The dominant force on the battlefield that day was Fort Ligonier itself. It proved too big and too tough for the French to handle with men and muskets alone. Bouquet's design and Forbes' insistence on building a strong fortification "just in case" saved the day and the campaign. With the conclusion of the Forbes Expedition, big changes came for Fort Ligonier. Pittsburgh became the gateway to the West. Fort Ligonier remained a major communications and supply base along the Forbes Road. Its strategic location on the western side of the Allegheny Mountains and only 40 miles from Pittsburgh was a critical link in the early western migration. Manned by only a skeleton crew, it was no longer a fighting fort. However, its fighting days were not over. In May of 1763, less than three months after the end of the Seven Years War, a violent Indian uprising called Pontiac's War exploded across North America. From Green Bay, WI almost to Philadelphia, PA, forts, settlements and farms were attacked without mercy. The inspirational leader of all this was an Ottawa chief named Pontiac. He kicked things off by attacking Fort Detroit and the violence quickly spread. The goal of Pontiac's coaltion was to drive out all white settlement and they came close to doing it. Within weeks, the formerly bustling frontier region was almost devoid of settlement. Fort Ligonier once again found itself in the middle of a war. Terrified settlers, militia soldiers and British troops all converged there for safety and cover. It was attacked twice in June. Despite the carnage, the British Empire - broke and tired of war - was slow to react to the rebellion. That changed when mighty Fort Pitt itself came under siege. The British commander in North America, General Jeffrey Amherst, assigned his best man - Col. Henri Bouquet - to relieve Fort Pitt. The relief force left Carlisle, PA on July 15, 1763. Moving along the Forbes Road, they marched the 130 miles to Fort Ligonier, arriving on August 2. They laid over for a day to re-organize for battle and headed out the gates at first light on August 4, 1763. Nobody knew what lay ahead or the fate of Fort Pitt, which had been cut off for weeks. Unbeknownst to Bouquet, the siege had already been lifted and the attackers were heading for him. They would collide near an abandoned way station along the Forbes Road called Bushy Run. 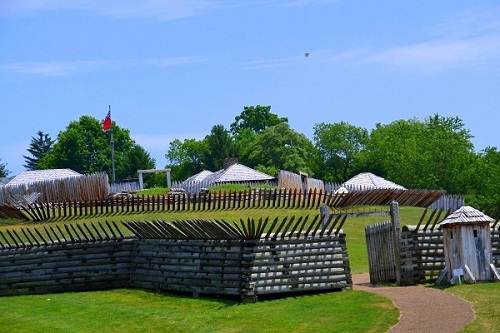 I'm a real fort fanatic and I never get tired of looking at Fort Ligonier. To me, this is what a frontier fort is supposed to look like. I've visited forts and battlefields all over the country and when it comes to log construction frontier forts, Fort Ligonier stands alone. I have yet to find another one restored to such painstaking detail and kept that way. I was born and raised in this area and I remember fort construction going on in the 60's. If you drive on westbound Route 30 (which follows the route of the Forbes Road) you practically drive under the battlements of the eastern redoubt. If you're in the area, don't miss Fort Ligonier. If you can't make it, here's a link to a very cool 360 panoramic from the inside of the fort. While still an important post on the way to Pittsburgh, the fort was undermanned and gradually drifted into disrepair. Much of its lumber and stone were appropriated by the locals. It was de-commissioned and abandoned in 1766 after only eight years of service. Reconstruction and restoration started in 1954, using only private funds. Now encompassing eight acres, those efforts continue to this day. There is an excellent museum containing some one of a kind artifacts. There are also exhibits on the grounds with things I have never seen at any other fort, especially the reproduction artillery pieces. The fort itself is a thing of beauty, towering over everything. During peak season, there are re-enactors scattered around the grounds. On our last visit there, we walked into the old supply building to see a man seated at a table with his eyes closed. We figured he was one of the mannequins until he opened his eyes and started talking to us. Scared the hell out of us. The Fort Ligonier website has all the information you'll need for your visit, along with some history and a calendar of events. Fort Ligonier Days draws thousands of people from all over and is always held on the weekend closest to October 12 to commemorate the battle. Plus, the fall leaves are usually at their peak. You can see the fort and the museum in two hours, although you're welcome to stay longer. While you're there, the town of Ligonier is just down the block and is worth checking out. It's centered around a town square with an old fashioned gazebo. Shops and cafes are everywhere. If you're cruising around western Pennsylvania or just passing through, don't miss Fort Ligonier. If you have no idea where it's at, here's a Google map. The GPS coordinates are N40.2412, W79.2389.